Football University’s Top Gun camp is coming back to Williamsburg VA for 2012. More than 1200 athletes from around the nation will descend upon the facilities at Warhill Sports Complex. Last years event drew players from across the US , Canada, ,the United Kingdom and Austria as the coaches put them through their paces. This will be the third year for FBU to finish their camp season in Williamsburg with the Top Gun event. This final camp is the culmination of a camp season that started in Hawaii in January. The camp which showcases the country’s top middle and high school top high school football players will run from July 19-21, 2012. Top Gun is the culmination of Football University’s 43-camp nationwide tour gathering the most elite performers from across the United States and allowing them to display their abilities together on one stage. Football University has an impressive alumni list that includes some of the top college football players in the nation, such as 2008’s No. 1 prospect and current Ohio State Buckeye Terrelle Pryor, 2009’s No. 1 prospect Bryce Brown, and 2010’s No. 1 prospect Ronald Powell, as well as U.S. Army All-Americans, Football University Youth All-Americans, and hundreds of Division I players. 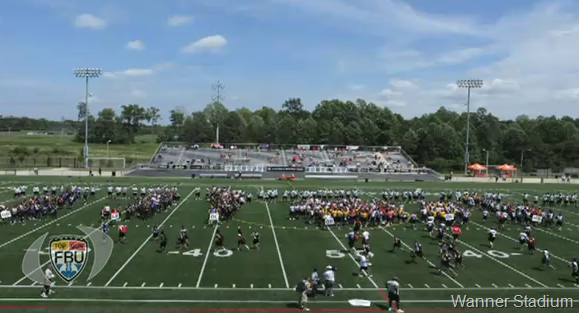 For 2012 FBU Top Gun will bring the 1000+ of the nation’s top athletes in grades 6 – 11 to Williamsburg, VA. Participating athletes are hand-selected by our NFL coaches from FBU’s 40 regional camps. At the heart of FBU Top Gun is its elite instructional staff made up of former NFL coaches and NFL athletes, who will spend three days with these elite athletes at Top Gun. Almost all of the instructors currently coach, play, or train top NFL and college athletes. Now entering its fourth year, FBU Top Gun will feature the next generation of football talent, including future U.S. Army All-Americans, college stars, and NFL stars. Football University: Top Gun- Youth Football Camp Will take place July 23-25, 2012, at Warhill HS and Sports Complex. All athletes must have been in 6th-8th grade in the fall of 2011 to participate in TOP GUN- Youth Football Camp. FBU is the nation’s most exclusive and elite football camp experience. Although FBU does have an invitation-only policy, due to the elite level of training and athletes, we strongly encourage athletes to nominate themselves. Please refer to the nomination and policy page for more information. More details on Football University can be found at www.FootballUniversity.org. TOP GUN: Who, What, Where, When? —Who? Approximately 1,000 elite youth and high school players chosen from the best of the Football University camps along with about 100 former NFL players and coaches. —What? The largest assimilation of prep and youth talent in North America where the top athletes from Football University can square off against each other to improve their skills and technique while finding where he stands through intense competition. —Where and When? This year, TOP GUN will take place Thursday, July 21 to Saturday, July 23 at the Warhill Sports Complex located at 4725 Stadium Road, Williamsburg, Va., 23188. Opening ceremonies kickoff at 2:15 p.m. ET on Thursday, July 21. Do you have to go to a FBU camp to attend TOP GUN? –TOP GUN participants are chosen from those standout athletes at their local FBU camp. Who decides which athletes are selected for TOP GUN? –TOP GUN participants are chosen by our NFL faculty and our FBU staff. What ages may participate at TOP GUN? –Athletes from grades 6 through 12 are invited. Welcome to the Williamsburg Youth Football and Cheerleading League (WYFCL), home of the HORNETS!! Established in 1997, our league is in its 16th season in 2012. As a member of the Peninsula Youth Football and Cheerleading Organization (PYFCO), we compete against the other leagues in our organization. We have 7 football teams broken down into age divisions (6-7, 8-9, 10-11, 12-14), with a sideline cheerleading squad for each team.